I have just added to my reviews of exceptional or excellent works by other authors. The review of OATH BREAKER by Erin Riley follows. Please see all of my reviews by selecting the Recommended Reads page of this site. When I reviewed the first book of this trilogy, I stated in my review, “As an author myself, I have read a substantial number of novels of many genres for over the last half century, and ODIN’S SHADOW definitely resonates as one of the best.” I wondered if the Author, Erin Riley, would be able to maintain the same quality for the two sequels. Now that I have read both of the sequels, the only problem I have with them is that I will not be able to enjoy a continuation of the story. Ms. Riley has become one of my favorite authors. He story telling is fantastic. Her character development is superb revealing emotions allowing the reader to easily understand each character’s actions… even the antagonists. Descriptions of the settings are developed quite well without creating many paragraphs taking away from the flow of the story. Although the listed genre is historical romance, the books are quality literary fiction set in historically accurate times from hundreds of years ago. OATH BREAKER has placed the keystone on a remarkable set of books. Disclaimer: I received an advanced review copy from the Author of OATH BREAKER. I came to know the author through writer threads on social media at the time she was looking for reviews for the first book in this series. Although I have never met her, I have found her to be a wonderful person to approach as I seek comments for my own writing. I look forward in anticipation for her next work. 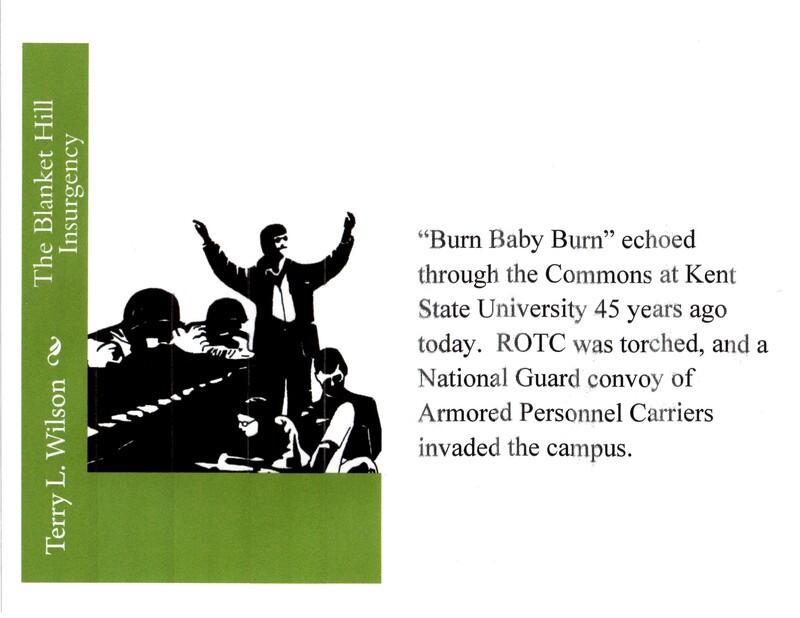 Today, May 2, is the forty-fifth anniversary of protesters torching the ROTC Building at Kent State University. Within an hour a convoy of National Guard vehicles invaded the once serene campus. Anger reached a boiling point, and the events about to unfold would prove to change the political and social landscape of America. Today, May 1, is the forty-fifth anniversary of the start of four days of chaos leading to the killing by National Guardsmen of four students at Kent State University. 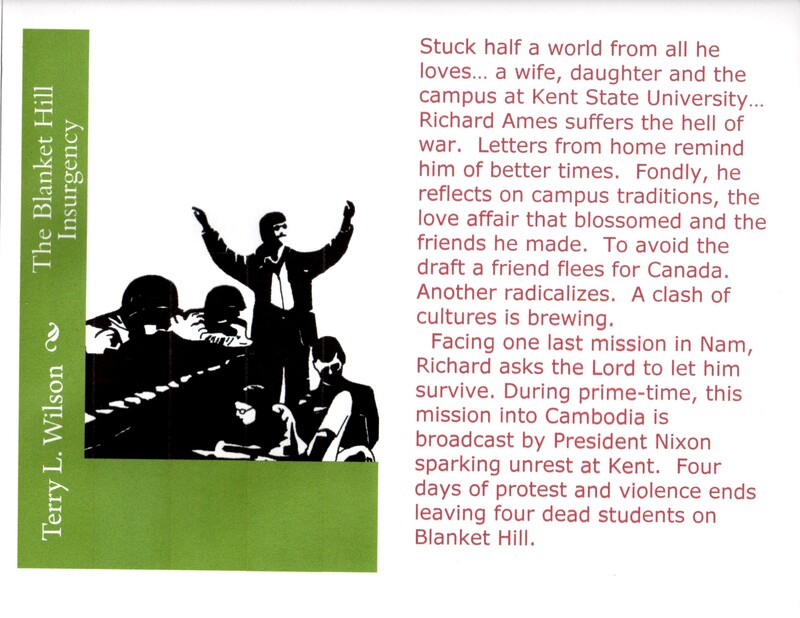 Ignited by a prior evening prime-time broadcast by President Nixon, three significant events occurred at Kent on this day. Protesters buried a copy of the Constitution on the Commons, the Black United Students rallied on front campus (warned blacks to avoid the expected turmoil of the next few days… no need to have fingers pointed at blacks) and rioting erupted in the student tavern section of downtown Kent followed by police use of teargas to disperse students on East Main Street near the front campus gate. 45 years ago today I officially ended my active duty time in the US Army, and was not prepared for what would occur in the following month. I returned to Kent State University to continue my education and was shocked to find the tranquil campus I remembered from three years earlier had changed. I witnessed the turbulence that built and exploded on Blanket Hill on May fourth as four students were shot by National Guard troops. 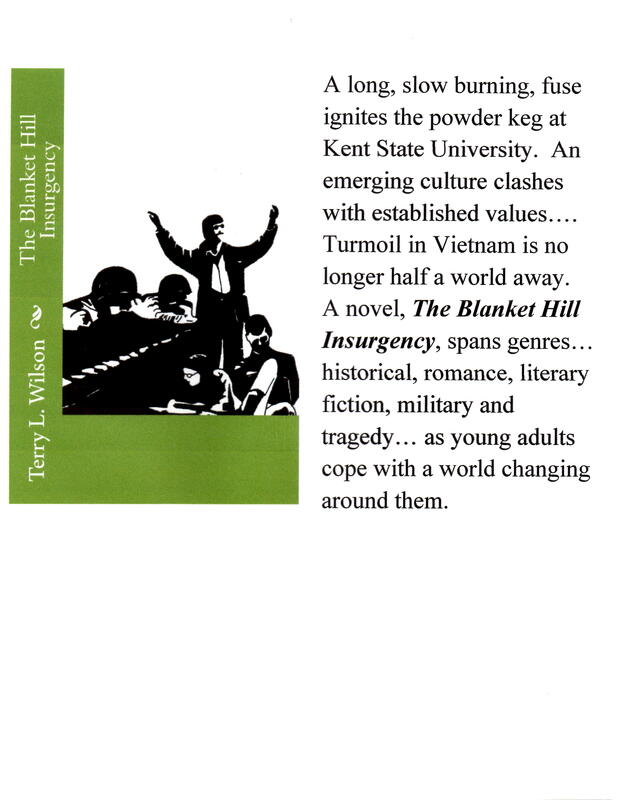 My novel, THE BLANKET HILL INSURGENCY, is history masked in fiction as the lives of a generation change. The God fearing and patriotic environment of post-World War II is attacked. “Better dead than Red” is replaced by “Hell no… we won’t go” as the nation fights a second war at home… a war between generations. Last May I had the pleasure to read a fantastic novel by then indie author Erin S. Riley titled ODIN’S SHADOW. I wrote and placed a review on both my site and on Amazon (a strong five star review). Last summer, the author was picked up by a publisher, Soul Mate Publishing, and this novel was no longer available to purchase through Amazon. I just found out that ODIN’S SHADOW is now scheduled for release by the publisher on April 2. It is well worth the read, and I am copying my review below, and I will repost it on Amazon upon publication. As an author myself, I have read a substantial number of novels of many genres for over the last half century, and ODIN’S SHADOW definitely resonates as one of the best. Examples of other works meeting my “best” list include ATLAS SHRUGGED by Ayn Rand, TIME AND AGAIN by Jack Finney and THE CITADEL by A. J. Cronin. Erin Riley focuses on the late ninth century and the savage and brutal invasions of Ireland by Viking raiders, and it follows these raiders back to their homeland in Norway. The raids result in enslavement of many Irish inhabitants, and for one young Irish girl a forced marriage to a War Lord. The civilizations of both Ireland and Norway of this time in the past are well researched and depicted…. As a reader my senses could feel the environment the characters experience while coping with emotional and physical conflict. The plot is well developed, but it leaves a bit of a cliff-hanger at the end…. Riley has left just enough to entice the reader to read her next book in a series, A FLAME PUT OUT. This novel is for adult readers.